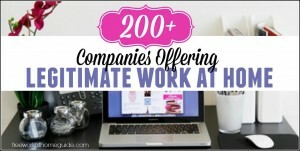 This massive list of 200 companies has been thoroughly researched. Some of them may not be actively hiring right now but nothing stops you from putting in your application for when they are ready to start hiring again. 1-800 Flowers – Temporary, seasonal, and permanent customer service work. Apple At Home – Chat, phone work, and technical support. Sykes – Customer support, chat, tech support, billing, and human resources. Apple – Customer service and tech support. ACD Direct – Flexible phone work. You can carry out book keeping right from the comfort of your home. All you need is an internet connection and a computer. If you are knowledgeable in this area and if you have worked as a book keeper before this is one way that you can make some real money online. Answering emails and responding to chats is another great way that you can make money online. This is a customer service position where you would be helping customers with their online orders or providing them with email support. Click here to learn more about the following chat support jobs above. This job needs you to carry out some sleuthing. You would be doffing up information as needed including civil records, legal records, deeds, tax liens, lawsuits and more. Your clients will include law firms, marketers, companies dealing in background information and home lenders too. 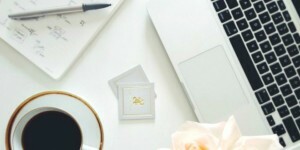 These are quite flexible and are a great way to get started working online. You will need basic computer skills and experience working with MS Excel and MS word. There are many scams for this particular category of work on the internet, so these legitimate sites will come in handy. Click here to learn to more about the following data entry jobs above. Get paid to carry out simple tasks online and to run simple errands. The tasks may include searching the net, online surveys or even watching online videos. Errands may include simple things such as going grocery shopping, doing laundry, picking up some dry cleaning and the like. Looking for more? 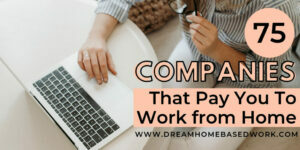 Ashlee from Work from Home Happiness shared a list of companies that pay you to complete odd jobs and tasks. More and more people around the world are interested in learning English as a second language. You can teach English from the comfort of your home to people who are on the other side of the globe. You will need a video link such as skype to virtually teach. There are several positions in the healthcare industry that you can comfortably do from home. You will need to education necessary to do them well, but not a lot of experience. These may be salaried positions or they may pay by the hour. They are medical transcription, medical coder and medical billing. You can do your graphic design work from home. As long as you have a computer and the necessary software, you can simply get your instructions from the client, do the design work and send it to the client for approval via email. You would be working for individuals, webmasters and businesses too. The recordings usually come in the form of MP3s. Your work is to listen to them and type out word for word. You don’t need much work experience but you do need to have a decent typing speed. You will also need a good grasp on English and work well under pressure because the deadlines can be tight sometimes. These are small jobs that are pretty quick to do. Usually they are tasks or services that you can complete online. If you want to make more money, you need to provide various services based on the time and skills that you have. Being an online moderator means that you will be spending time on various online forums, social media sites and chat rooms simply managing the comments that others write. You will be responsible for kicking out those who break the rules and keeping the energy positive. If your spelling and grammar is good, you can use your English skills to proof through written work finding and minimizing errors. This is a great job for those who enjoy reading. All you need is a computer and internet and you are ready to start. Job seekers around the globe are looking for help with writing resumes. Often these jobs are posted online. If you have a good command of the English language, can write persuasively, are good with formatting the person’s work experience, skills and education so that they appear professional, this could be for you. Your work will be to evaluate the results of each search engine to determine whether or not the search results are indeed accurate. You will be looking to see that they are free of spam, timely and that the keywords used are relevant. Click here to learn more about the following search engine evaluation jobs above. If you are well conversed in a language other than English, especially one that many people speak, you may get a position translating documents, calls, meetings and correspondence. Individuals or businesses that deal with multi-lingual businesses often find themselves in need of these services. You will be working with students one on one teaching them a subject that you are good in. Usually Skype is the mode of communication but another video link may also be provided. Students will learn virtually and you don’t need to commute to where they are. For this position you need to have administrative and secretarial skills. You would be helping small businesses or individuals with their daily administrative tasks. You may also be expected to help out with social media and other technical services. You would be given a set of instructions that you are to follow in order to test the website. Once you have done so, your work is to provide feedback to the owner of the site. The owner is usually looking to see if their site is easy to navigate and also intuitive. If your written English is good and you enjoy putting your thoughts on paper, a writing job may be perfect for you. Usually it involves writing blogs and articles on behalf of different clients for search engine optimization. There you have it! 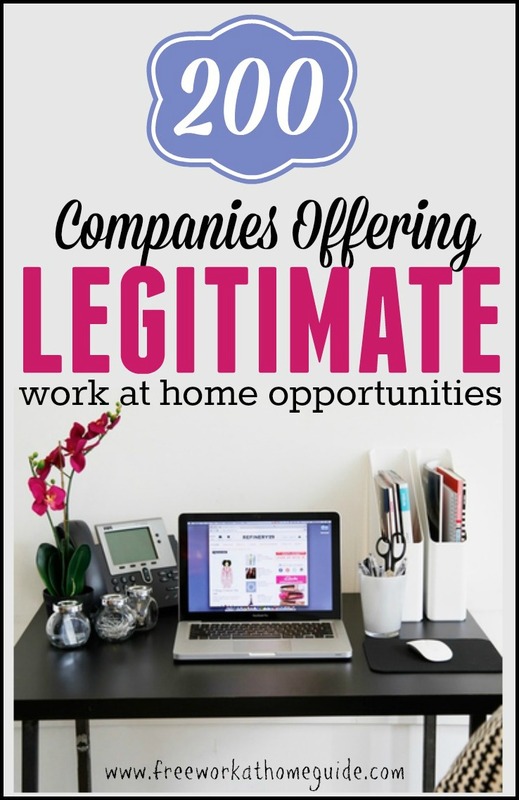 A massive list of companies that offers legitimate work at home jobs. If I missed any, please share them in comments below. Looking forward to hearing from you!